The City of Phoenix has issued a proclamation regarding Equal Pay Day which is the date that symbolizes how far into the year women must work to earn what men earned in the previous year. That day is April 4. Central Phoenix/Inez Casiano NOW is hosting a press conference to commemorate the proclamation and urge action to eliminate this economic harm to women. The press conference will be Tuesday, April 4, 10 a.m., City Hall, 200 W Washington on the first floor. Speakers will include City Council member Kate Gallegos; Central Phoenix/Inez Casiano NOW President Olga Tsoudis; Stephanie Vasquez, owner of Fair Trade Cafés; Quiana Dickenson professor and consultant with Arizona List; Nancy Jurik, Professor of Justice and Social Inquiry in the School of Social Transformation at ASU; Cindy Guerra – LULAC District 1 Director; Akansksha Mishra, Senior at Basis Peoria; Rebecca Friend, Executive Director AFL CIO; and others. Women will be wearing red to show that women remain in the red for over three months because of discrimination in pay. At the conclusion of the press conference, women will be delivering cakes to their elected representatives with the appropriate pieces missing i.e. 16% for white women in Arizona, 19% for Asian women, 33% for Black women, and 46% for Hispanic women illustrating that is how much of their work product is robbed from them every year. UN Women calls the pay gap “the biggest robbery in history.” In Arizona more than 304,000 family households are headed by women. About 31% of those families have incomes below the poverty line. 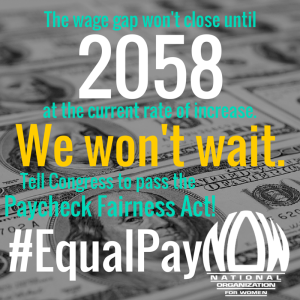 Eliminating the gender pay gap would provide much needed income to women whose wages sustain their household. The pay gap exists in all fields and educational levels and at least 38% of the gap cannot be accounted for by any differences in experience, education, occupation, industry, race, region or unionization. Continued discrimination against women is the reason for the gap and must be eliminated.